Don't let pests, plague or disease rain on your parade! Choose hardy strains that stand up to the worst that Mother Nature throws at them to increase your chances for ultimate success. With premium cannabis seeds like Green Poison or MiG-29 Auto, you won't have to worry about spider mites, fungus, thrips, aephids, fungus gnats, and other nasties. Order Your Hardy Strains from Gorilla Seeds Today - You'll Be Glad You Did! A Real Beast - 900 gr/seed with 20% THC! Monster Mass has more than earned her name! Yields are a beastly 900 gr/seed outside & 800 gr/m2 inside with fast finishes & astounding THC. Ata Tundra is a 100% Indica cross of Matanuska Thunderfuck from Alaska & a Kazakhstani strain from the Middle East. She's as tough as she is strong! Very Stealthy - Easy to Hide! If you're looking for the ultimate stealth strain, you have to get your hands on some Auto Duck Seeds! You can barely tell this potent beauty is weed at first, and the odour is barely detectable even at the end. Brilliant! Get AutoBrooklyn Sunrise & find out why everyone's in love with the Big Apple. This cannabis seed is based on 100% pure NY genetics - half from the NYC itself & half from Upstate! The Perfect Outdoor Auto for the UK! Dutch Passion improved their best outdoor AutoFem with brighter colours, a higher resistance to mould & an even better taste. AutoFrisian Dew is your only choice in the UK! The Berry Bomb Auto is exactly the same as her big sister with a high yielding, fruity, main cola and powerful THC punch, but this automatic babe will be ready in only 70 days from seed. Turns blue & same buzz as big sister! Fast, Hi-Yielding & Cold/Moisture Tolerant! With the British Auto Outdoor Mix, there's no bad spot for you to go full-blown guerilla. This variety pack only includes strains that thrive in the harshest conditions. Kaya Gold is a Sativa-dominant species, highly resistant to pests with a sturdy structure. This rugged strain can thrive in most climates, owing its resilience to great breeding that delivers a big bodied, early turning hybrid. Nirvana Seeds closely guards (or chooses not to disclose) KG's exact lineage, which only adds to the mysterious potency of these cannabis seeds. 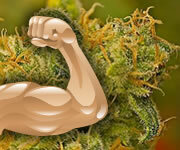 Bullet-Proof Cannabis Seeds - Just What You Should Order! There's nothing more heartbreaking than investing weeks of your time only to have your dream seeds succumb to some weird disease or pest you can barely identify. Don't risk a broken heart - try one of these hardy strains instead! Does that mean you can throw caution to the wind? Of course not; contamination and inattention can do in even the most robust bean. It only means these weed seeds have a fighting chance if they're accidentally exposed to the most common diseases and pests that reek havoc on lesser breeds. Sold on these hardy strains? Choose from robust autoflowering seeds, incredibly stable feminized seeds or rock solid regular beans. They're all good and The Gorilla has the absolute best prices on the net. You will not be disappointed! Do the Right Thing - Grab Your Hardy Strains Today! NB: Even though these marijuana seeds are genetically engineered to stand up to harsh conditions, that doesn't mean you should try to grow these hardy strains. It's illegal & against The Gorilla's rules. And, you wouldn't want him after you - or would you?